Touch Ups Collection by Benjamin Walk sets the standard in the bridal industry. 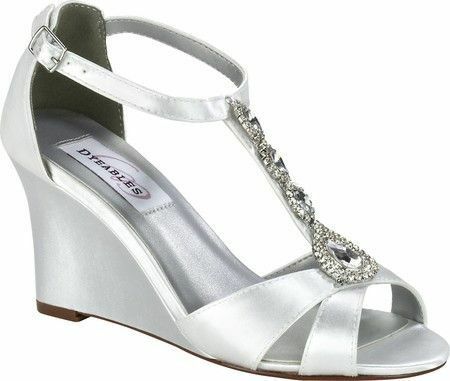 Beautiful bridal shoes, from classic pumps to fashionable platforms, destination sandals and delicate ballerina slippers. Bling-y platforms! Sparkly sandals! Rhinestone-embellished tennis shoes! We've got the perfect shoes to compliment your outfit! We just received the latest collection, and can we just say, "WOW!" Come see them for yourself! Designed with couture fashion elements, these shoes are definitely for the shoe fashionista! You'll love our David Tutera Shoes with a "something blue" sole... for that perfect foot pop! The Bride's Shoppe can dye your shoes any color! Match your bridesmaids dresses, make your shoes your "something blue", or wear bright fuchsia shoes with your bridal gown! Cost is $15 per pair to mix and hand dye our shoes. Most shoes purchased elsewhere are unable to be dyed. If they are dyeable, a fabric swatch would be included in the box. Prices to dye shoes not purchased at The Bride's Shoppe will vary.